Steve is in his second stint at BRAIN. He was here at the beginning in 1992 while still working for a bike shop in Santa Fe, N.M. He wrote several articles for BRAIN's first issue and later joined the staff, eventually becoming managing editor and then executive editor. After leaving BRAIN in 1997 he worked for several news organizations including The Associated Press and VeloNews before rejoining BRAIN as web editor in 2011. He is based in Longmont, Colorado, and is an enthusiastic (and slow) road, mountain bike and cyclocross rider. WASHINGTON (BRAIN) — PeopleForBikes and the Bicycle Product Suppliers Association have submitted requests on the industry's behalf for exemption from the 25 percent tariff on Chinese-made e-bikes that took effect last summer. The deadline was Thursday for submitting the requests to the U.S. Trade Representative. KENT, Wash. (BRAIN) — The CEO of Accell North America says he is feeling "very good" about where the business is and he's expecting a lot of improvement in 2019. LOVELAND, Colo. (BRAIN) — When Scheels All Sports opens one of its gargantuan sporting goods stores in a new community, the local press gushes over the tons of steel and truckloads of concrete needed to build the quarter-million-square-foot stores. Officials and business owners in nearby communities, meanwhile, tally up the "Scheels Factor." Scheels megastores make huge impact on local retail when they come to town. 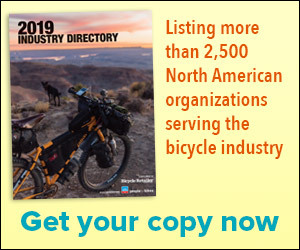 SAN JUAN CAPISTRANO, Calif. (BRAIN) — Emerald Expositions has canceled the 2019 edition of the Interbike trade show, saying the event might return in a more modest format in 2020. DURHAM, N.C. (BRAIN) — Taiwan-based manufacturer Ideal Bicycle Corp. has told the bankruptcy court here that it opposes Advanced Sports Enterprises' request to be released from its manufacturing and licensing agreements with Ideal. DURHAM, N.C. (BRAIN) — The company hired last month to run liquidation sales at 40 Performance Bicycle stores has expanded those sales to the chain's 62 remaining stores. Performance's parent company, Advanced Sports Enterprises, filed a petition for Chapter 11 bankruptcy protection on Nov. 16. ASE said the sales don't mean all stores will close.